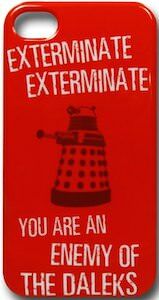 Are you a friend or enemy of the Daleks? This Doctor Who iPhone case will make you wonder what the answer is. The phone case is red and fits the iPhone 4s and iPhone 4 and on the back of the case it shows a picture of a Dalek and two of their famous lines “Exterminate, Exterminate!” and “You are an enemy of the Daleks”. Of course you phone deserves protecting and what better way to do so then in a case that is based on Doctor Who. OK it maybe a Dalek iPhone case but it still is a Doctor Who case. Come and have a closer look at this Doctor Who Red Dalek iPhone Case.